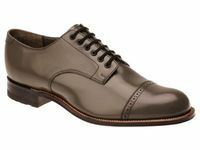 Stacy Adams Madison Shoes | Stacy Adams Madison Shoes On Sale! Stacy Adams Madison shoes are a literal time machine. If you were able to go back in time a hundred years, one thing you would see on the well dressed man would be the original Stacy Adams Madison Shoes or even Stacy Adams Madison Boots for purchase. The Stacy Adams Madison are the vintage style shoes that started Stacy Adams Shoes with their old school appeal. Stacy Adams Madison shoes and boots are a timeless vintage style that looked great a hundred years ago and continue to look great today that you can actually buy. They have that period correct 1920s vintage style when the roaring twenties was actually in effect. When you're trying to buy 1920s style dress shoes for men, these are the ones that should be high on your shopping list just because they are the same exact style that were around back then. Shop for Stacy Adams Suits Here. Who doesn't love the way they look in a sharp Tuxedo. We aren't just about stylish Mens Suits. If you want to take up a few style notches, try some Belvedere Shoes. Maybe you're shopping for Zoot Suits. 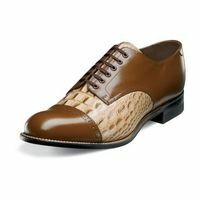 These rich and earthy dark olive green Madison shoes by Stacy Adams will prove time and time again why they continue to be worn by men who appreciate classic style and dressing with the Biscuit Toe style and Goodyear welt construction, you will know right away that the Madison is the Real McCoy. Step back into the days of elegance with Stacy Adams Madison Shoes. For over 100 years Stacy Adams Madison Shoes have been worn by men who appreciate vintage style. 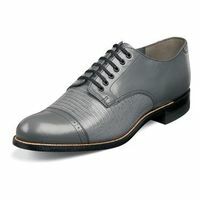 Stacy Adams Madison Shoes are now available in many colors and styles. With the classic look that only the Madison by Stacy Adams has, you too can appreciate the style that first made Stacy Adams shoes famous in the beginning and well into the future. A pair of Brown Stacy Adams Madison shoes will be a treasured addition to your shoe collection. 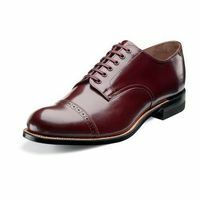 A rich dark Burgundy can hold a shine if they are the Madison by Stacy Adams Shoes. These Burgundy shoes will glimmer and beg you to keep them shining every time you want to show your style off and wear them with your favorite suit or walking suit. There is no need to just buy any old white dress shoe when you are able to buy a pair of white Madison shoes by Stacy Adams. Featuring the tried and true classic biscuit toe style that made the brand Stacy Adams famous, the Madison in white is the way to go. They made sense a hundred years ago and they still make sense today. The Madison by Stacy Adams shoes are the iconic dress shoe that exists in a time of fast paced style that is won't go out of style. 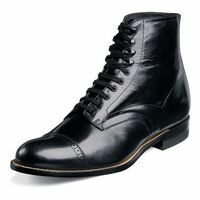 From the Cap toe look with the 7 eyelets and Goodyear Welt constuction, you won't mistake the Madison for anything else. 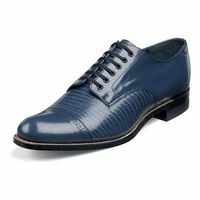 Sure, you have seen navy blue shoes and you may even own a pair but the Madison crafted by Stacy Adams is an iconic shoe that even in the color navy blue begs you to take serious consideration when it comes time to buy a pair of navy blue dress shoes. These rich dark tan looking shoes called the Madison by Stacy Adams are a shoe that you can wear with so many of your suits and dress clothing with just the right amount of creativity and attention to detail. Featuring the long lasting all leather sole and rubber and leather heel, you know that you made a choice you won't regret. Size 10.5 Only Your father may have worn them, Your Grandpa may have worn them. Heck, even Your Great Grandfather probably wore them. The Madison by Stacy Adams. The original classic shoe that has been around since before the 1920s. 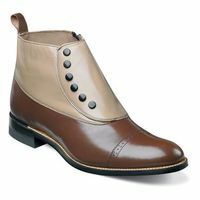 Stacy Adams Madison shoes are a flash to the past. Today you will find that Stacy Adams Madisons now come in huge array of colors and several vintage inspired styles that simply weren't available years ago to buy. If you have wide feet, you can be rest assured that you are not ignored because we provide wide width Stacy Adams Madison shoes in wide widths as well. Now you can get Stacy Adams Madisons in exotic print leathers such as Crocodile and Lizard to buy as well. Stacy Adams Madison Dress Shoes were originally called the Biscuit Toe Shoe because of the look of the Cap Toe. 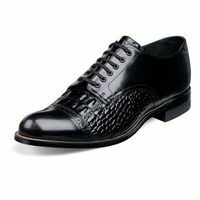 Stacy Adams Madison Shoes and Boots are made of Kidskin Leather Uppers,Leather Linings and Leather sole with Goodyear Welt construction and Steel Shank Support to hold it's Shape. That same superior quality worked during the 1920s and it still holds true today when it comes to making these vintage style mens shoes for purchase. Read More about Stacy Adams Madison Shoes. 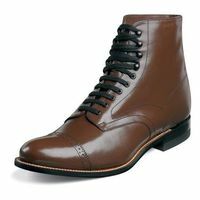 If you are looking for a great online store to buy Stacy Adams Madison Dress shoes and boots, ContempoSuits.com is the place for you. Learn More about Stacy Adams Here. There are not too many shoes for purchase online that you can buy today that you were able to buy a century ago. Name something, anything that you are able to purchase today that you could have purchased over a hundred years ago. If you can, it might take up only a couple fingers on one hand. One of those fingers may be a pair of the original discount Stacy Adams Madison Mens Shoes. In an age of Smart phones and Twitter it is hard to find something that exists for purchase that existed in a time when you had to hand crank start your automobile. Think about it, we live in a time of New. Everything has to new, from style to technology. Buildings, they don�t get repaired anymore, just knock�em down and build new. Well in the world of mens shoes to buy, it's hard to find stores that sell the original Stacy Adams Madison shoes and it�s still nice to know that somethings will never change. We carry a huge selection of Stacy Adams Madison shoes online in all the colors and styles that you can buy. 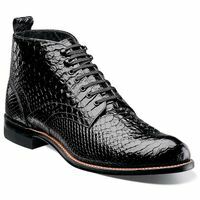 Keep mens fashion tradition alive and buy the same iconic shoe styles that men of a bygone era wore when it was of maximum importance in how a man dressed. If there is a way to start your menswear collection on the right foot, you need to take a serious look at Stacy Adams Madison. If there is a way to have people have immediate respect for you you need to wear the right thing and the right shoes and one of those shoes that just seems to garner respect are Stacy Adams Madison Shoes. 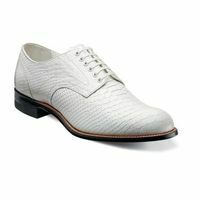 The Original style Stacy Adams Madison Shoes on sale are a cap-toe shoe that have been around over a century. Sounds crazy, right. 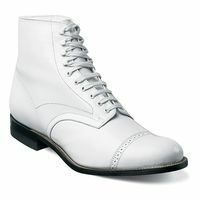 Discount Stacy Adams Madison shoes were called the biscuit toe shoes by fans since the cap toe resembled a biscuit. 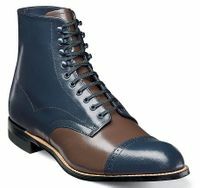 Stacy Adams Madisons for men are made of the same exact style that you could buy a hundred years ago. They have that period correct 1920s style and attitude . Constructed of fine kidskin leather and fully leather lined inside for comfort and moisture wicking, finished with a durable leather outsole and Goodyear rubber heel. The one difference is that Stacy Adams Madisons online come in a huge selection of color and leathers. Back in the olden days you were blessed to be able to buy them in either Black or Brown but now they come in over a dozen varieties. 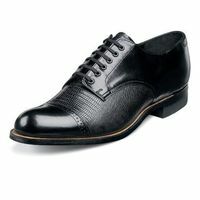 Discount Stacy Adams Madisons are simply a shoe design made to last for the well dressed man. It�s been said before that quality never goes out of style and I believe that fully. People with intelligence want to get their money�s worth. Who wants to buy something that is obsolete in few months anyway like all the smartphones out there. Seems almost criminal. So if you're shopping online for Stacy Adams Madison shoes and are looking for stores that sell Stacy Adams Madison Shoes, you've come to the right place to find a style that you suits you. When you buy Stacy Adams Shoes, your wardrobe and you will look your absolute stellar best. 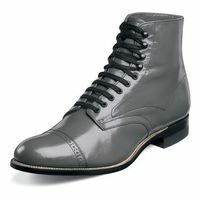 So, when the time comes to buy Stacy Adams Shoes, ContempoSuits.com is the Online Store for You.